Many of you who know me are aware that I do not get much time to go out agate hunting. However, when I do go out — especially when I go to Minnesota, I am able to put my knowledge to use. My poor eye sight requires that I get close to the rocks in order to see them. Of course, I always have my 10 power “eyes” on while agate hunting. Usually, I dig to get down to layers that others may not have searched. At the request of many museum patrons, I have included a picture of the bowl of agates I’ve found so far this year. I wish I could say I have found a “fister”, but so far one has eluded me. My friend, Renee Beaver, also makes a repeat visit to the web page. Earlier this month she headed to the beach after one of the storms. Some storms cover the rocks up and/or undertows them back into the lake. However, other storms mix up the rocks to perch new agates up on top. Apparently, the storm that preceded Renee’s agate finds was a GOOD storm. She found 16 good agates — which for Grand Marais is a great day! Since I was not in town for half of July, I have fewer customer agate find pictures. There are a couple, though. Actually, the first specimen is one that email pictures were sent to me by Dana Maudel, from McGregor, MN. She said in the email that her boyfriend found this specimen. I emailed back to ask more questions about the weight and location, but did not receive a response. It is unusual and remarkable enough, that I am going it include it in this month’s web page update. It is quite large, over 10 pounds. It appears to have unusual tubes running down the side of the specimen. Has anyone ever seen anything like this before? The second agate is one found in the Grand Marais area by Michael Webb from Dearborn, MI. He brought it in during Festival Weekend, but I forgot to take a picture of Michael holding the agate. He asked me to face polish the agate and mail it back to him. It is extremely translucent with the carnelian fortification pattern along with various inclusions. Nice agate! With the melting of the icebergs on the beach has come the early-season agate hunters. Mike Miller makes a return to the web page with his friend, Terry House — both from the Muskegon/Fruitport area. Terry House found this nearly half-pound nodular agate with well defined banding around a quartz center fill. Mike Miller found two nice agates. The first is a small but beautiful agate with a carnelian center. The second is an absolutely amazing water level agate that is around a third of a pound. These agates and more were found east of Grand Marais. Congratulations Terry and Mike! Dan Kinney from Sault Sainte Marie, MI has made the web page again. If you remember, last summer he found the large brown agate, which he later donated to the museum. When he donated the agate, he said that he would just have to go out and find a bigger one. Well he did. Just before the snow started to pile up, he managed to find this pounder. It is a paintstone agate with zillions of bands that don’t show up too well in this photo. None the less, it is an amazing find. Dan asked me to face polish the specimen to accentuate the banding. I am glad I had the chance to “dress up” this agate. When I went to the Soo to deliver the agate, as well as to run errands, I was able to finally see some of Dan’s agate jars. Wow! Although the Grand Marais area did have snow in December, the relatively warm lake temperatures allowed rockhounds to agate hunt during most of the month. This 3.3 ounce agate was found by Jody Patton, from Curtis. She and her husband, Jim, dropped it off a couple of weeks ago and asked me to face polish it. Once I saw the specimen, I eagerly urged them to do so since it is a marvelous shadow agate. In the rough, you could tell that it would shadow but the optical quality was only fully visible through polishing. Congratulations, Jody, for finding this terrific Laker in December! The fall update features another reappearance from the original web page. Earl Johnson, from Newberry, MI, and his wife spend most of the summer in Grand Marais agate hunting. While they were on the beach, they spoke shortly with my friends, Gerald and Jill, who I go to Moose Lake with each July. Gerald, with his wet suit on, was kneeling in the shallow water. Soon after he swam off, Earl looked down to the spot that Gerald was kneeling and found this large one-pound peeler! Earl asked me to face polish the end, which had great results! George and Marion Curtis, of Grand Marais, were visited by their son Jeff and family from British Columbia. Pictured below are Jeff, and daughter, Katie. While here, they found this 2-½ pound specimen. From the outside, it was difficult to tell exactly what was going on so they asked me to cut a slab off the end. We were surprised to see this unusual, paisley moss agate. Each summer the Newago Rockers come to Grand Marais to agate hunt. It seems that the group gets larger each year as the rockhound “virus” spreads. 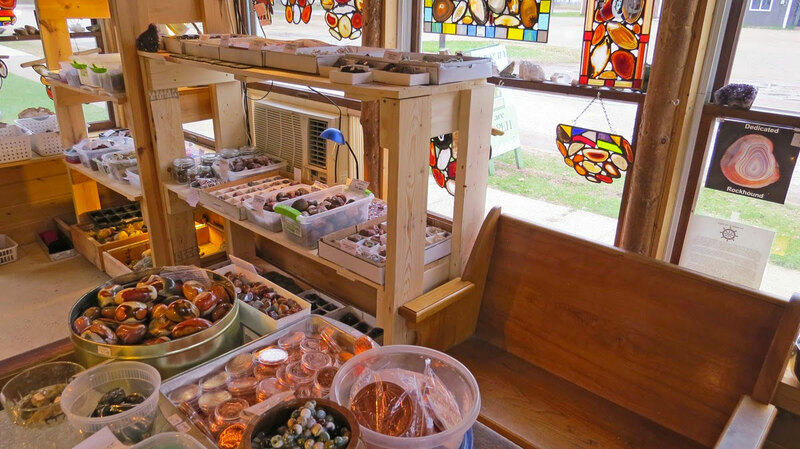 Pictured below are some of the agates that Gretchen Fairnosi and family found this year. One more agate found early this fall was a gray/white shadow agate by Rick Waml. What is interesting about this agate, which I face polished, is that it appears to be similar to a Botswana agate. In fact, I would have bet on it so either someone seeded the beach with a Botswana agate, or most likely, this specimen shows how similar agates from different locations can be. Several great agates continue to come into the museum. Some of the rockhounds who were featured in the original web page, which was not archived in the new web page, have taken on the challenge to reappear. Mark and Lynn Boll from Amherst, WI are the first to accomplish this feat. Pictured are four of the many agates they found while vacationing in the Grand Marais area this month. The upper left agate is a spectacular tube agate. The picture does not adequately show how the tremendous translucency allows you to see the tubes from end to end. The upper right specimen is not agate, but it is an unusual orbicular jasper. Mark and Lynn asked me to face polish all four specimens. Allison Testolin from Iron Mountain, MI found this large 6 ¾ pound specimen. Although it does not have a distinctive fortification pattern, there is agate popping out throughout the rock. The agate king so far this summer is Dan Kinney from Sault St. Marie. He found this ¾ pounder, half pounder, and two 1/3 pounders!. The latter two were found on a 20-mile trek near the Vermillion Light House. Since Dan doesn’t have a four-wheel drive, he had to walk 7 miles into the lake shore and back out, plus he searched 3 miles down and back along the shore. Congratulations, Dan — nice agates! I don’t know if it is the low Lake Superior water level, or the tremendous weather we have been having, but people have been finding some terrific agates this spring. The next agate is one of the strangest I have ever seen.It was found by Jacie Hunnicutt from Lansing. It appears to have formed as a concretion, inside of a partly-hollow pocket with a chalcedony outer layer. A second picture of the bottom has a distinctive fortification pattern as well as two six-sided, inch and a half hollow cavities, which appear to have had macrocrystals that have since popped out.If anyone has seen a Lake Superior agate like this one before, or if you have any ideas about the genesis of this rare find, please send me an email to . The next agate was found by Mike Miller from Muskegon, who is pictured below with his wife. This is a beautifully delicate Lake Superior agate with white banding, as well as some carnelian sections. This specimen was found east of Grand Marais. The last specimen featured this month was found in the Grand Marais bay. The finder wishes to remain anonymous, but has agreed to let us feature the agate in this update. Some surface fractures caused its “owner” to decide to have it face polished. This specimen is one of the finest carnelian agates I have ever seen, which also features some nice shadow bands. It has been difficult to decide what to include in this revamped web page from the original. I’ve gone back and forth on deciding whether to include all previous customer agate finds. In the end, I’ve decided to start anew. I would like to thank all of those who have been featured in previous years for sharing their agate treasures. In the future, we will retain one to two year’s worth of customer agate finds. We will also be a little more descriptive of the featured rockhounds and/or their agates. Renee has lived in Grand Marais on and off since she was a child. After living down state for more than a dozen years, she returned to Grand Marais last September to work at Burt Township School. Last fall and this spring, she has spent a considerable amount of time on the beaches. These are just a few of her recent finds. NOTE: Renee’s father, Neal Beaver, wrote the introduction to Understanding and Finding Agates. Neal, who recently passed away, was a major influence on my life. Renee also is my oldest friend.